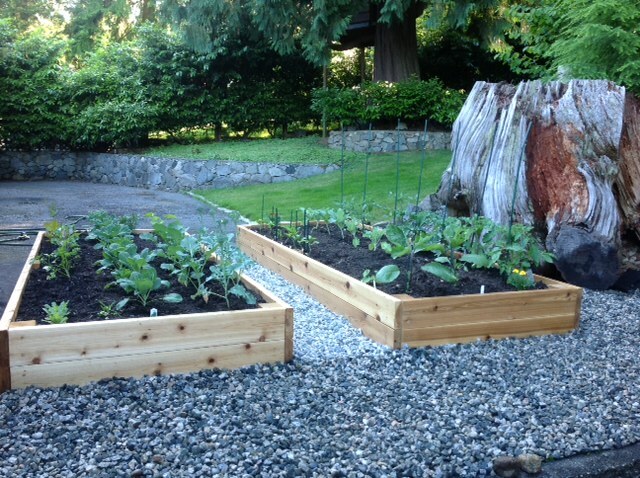 Urban Gardening | A-BBY Landscape, serving Burnaby, Vancouver & surrounding areas. What makes Urban Gardening with Raised Beds so great? The practice allows you to enjoy plants in areas where a traditional garden is awkward or impossible. Even with limited space in an urban apartment, you can grow fruits, vegetables, flowers and shrubs just about anywhere. Plants thrive on rooftops, decks, balconies and stairs. You can locate Containers, Planters or Raised Beds where they are most convenient for you and where they will grow best (place the tomatoes in full sun and the lettuce in partial shade.) They offer better control over growing conditions (water, sunlight, nutrients) can lead to higher yields with less work than a conventional garden (10 sq. ft. can produce 50 lbs. of fresh organic produce). Instead of battling against poor soil conditions, you build above ground, where you have absolute control over the soil texture and ingredients.These gardens are easier to protect plants from weather extremes, insect pests and bigger critters. Get a quicker start in the spring and grow further into the fall. Vertical growth saves space and allows use of exterior walls. We find many customers are concerned with having a deep container, truth of the matter is anything over 16″ is just a waste of soil and materials. Our most popular planters are 12″ and 16″. We have grown high yielding 7.5′ tall Heirloom tomato plants in 12″ of soil! Salad greens, Asian greens, mustard, garlic, radish, basil, cilantro, thyme, mint, and marjoram. (Salad greens and some herbs have shallow, fibrous root systems and are well suited to shallow containers with a large surface area). Can be grown in 4-6 inches, a living wall can also be a good choice to maximize space. Do I need to remove the Lawn before installation? A no digging required alternative! reclaims the lawn with an organic “lasagna” of cardboard, compost, and mulch. This is a low-effort way to create a garden bed while adding fertility to the soil. You can do this project in an afternoon with some friends. 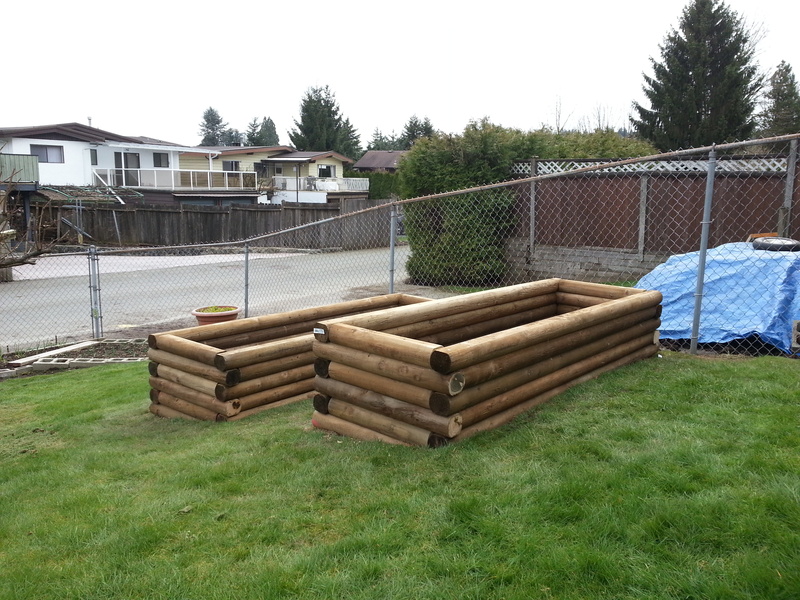 Keep in mind if the raised bed is deep enough the new soil will smother the sod on its own. Do I need a bottom? There is no need or purpose for a bottom when installed on soil, sod or gravel. A bottom is used when the Planter or Raised Bed is to be located on a patio, deck or balcony. We have several methods depending on the circumstances. One way this can be achieved is by installing cedar fence boards and a couple layers of filter cloth. We have found a simple tarp is also very effective, if the bed is to be moved at some point in the future, or an adjustment to the soil is required. The planter can simply be lifted up over the soil, and then the soil be moved on the tarp. What type of materials are best to use? Western Red Cedar is one of the few wood species that are naturally at home in the outdoors. Western Red Cedar will last for decades, even in harsh environments. Its natural resistance to moisture, decay and insect damage make it the ideal choice for a surface that is exposed to sun, rain, heat and cold all year round. Other materials are SPF lumber or Treated. Standard SPF though inexpensive doesn’t share the same characteristics of Western Red Cedar. It is often a good choice for a renter who doesn’t want to invest too much. Or someone who needs to cover a large space and seeks volume. Cedar is also very aesthetically pleasing, it has a beautiful grain, color and scent. Mini Ties (seen below) can also be used and are not to be over looked, they produce a very solid long lasting structure and work very well. Natural Dry Stacked Stone also makes for a beautiful garden. Treated 4″x4″, 4″x6″, and 6″x6″ are also options though these are more commonly used for Landscaping. Overall we feel our raised beds and planters are some of the best available in the city, with our quality of build and service you won’t be disappointed.